The Vashon Island Chorale was established in 1989, and is dedicated to the promotion of fine choral music in the Vashon community. The repertoire of the Vashon Island Chorale focuses on major masterworks from the past four centuries. Highlights of recent seasons include the Orff's Carmina Burana, Vivaldi's Gloria, Christ lag in Todesbanden by J.S. 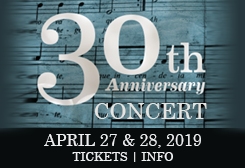 Bach, the Mozart Requiem, Saint-Saëns's Christmas Oratorio, the Brahms Requiem, Kodály's Missa Brevis, Dona Nobis Pacem by Vaughan Williams, Bernstein's Chichester Psalms, and Morten Lauridsen's Lux aeterna. The Chorale also regularly presents works by local composers, including residents of Vashon Island and the greater Seattle area. Artistic partners have included members of Vashon Opera, the Vashon-Maury Chamber Orchestra, the Portage Fill Big Band, and the Signature Brass Quintet. Gary D. Cannon has led the Chorale as Artistic Director since 2008. The Chorale awarded its annual scholarship to an impressive VHS graduate, Alivia Jones. Alivia graduated from Vashon Island High School in June 2018 as one of the top ten students in her class. She is attending Pacific Lutheran University this fall and is planning to major in vocal performance. A singer, actress, and language lover, she hopes to one day perform in opera houses around the world. Her experiences with Vashon Island Chorale have helped shape her passion for music and have brought her great joy. We're so proud of your achievements, Alivia! Membership in the Chorale is open to all, without audition. The Chorale varies in size from 60 to 90 members. Skill levels vary from dedicated amateurs to professional musicians. The ability to sight-read is helpful but not required. Dedication to hard work and having fun is a must. The Chorale rehearses on Tuesday evenings from 7:00pm to 9:15pm at Vashon Presbyterian Church. For information about the group, contact the board president, Jo Ann Bardeen, at info@vashonislandchorale.org or 206-683-4556. Vashon Island Chorale is a 501(c)(3) nonprofit organization.